The developers departed, the lights have been shut down: OrobienStep has ended. We had a nice developer meeting in Italy, near Bergamo. We started Friday evening and went on to Sunday afternoon. Staying at Hotel Quarti, we had a convenient meeting room equipped with LAN, WLAN, Beamer, flip-chart... Attendees were Fred, Nikolaus, Gerold and of course myself, Riccardo. Gregory was able to communicate through skype and webcamera. Friday was more a warm-up day. Windows work was a bit halted since the new make from svn busted both my gnustep installations. That overcome, work started well. We tackled several areas and poor Fred was a bit overbooked since a lot came down to gui and back. A lot of information was exchanged, ideas discussed... I think everything was quite interesting and if an actual implementation follows it will be great. All in all, everything was packed and productive. Nice trips to Italian restaurants were in, but unfortunately due to the tight schedule and the cold weather, no sightseeing was possible. After several weeks of work, I can announce my first concrete success: the download of the contact list from the CRM to a CSV file. On supported platforms, like Java or C#, salesforce.com offers libraries for a convenient access to their APIs (webservice interfaces). For Objective-C and GNUstep of course there is nothing of the kind. Thus I started writing a layer to access the webservices directly using SOAP calls. To be able to write those, I use GNUstep's WebServices framework, which I discovered was still quite rough and incomplete. Richard Frith-MacDonald though promptly debugged it and extended it. Until the first login was possible, a lot of debugging and investigation on the calls was necessary, I was patiently supported by my colleague Andrea Rosa. My intention is to develop DataBasin to be a free Open Source alternative to the DataLoader tool supplied by salesforce.com. Once I reach that goal, I alreayd have further ideas on how to extend it. 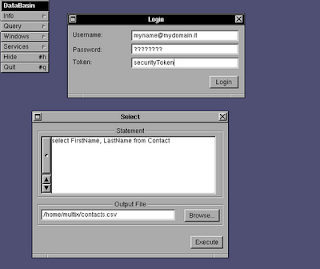 DataBasin is part of the GNUstep Application Project and will be released there once ready for prime time.